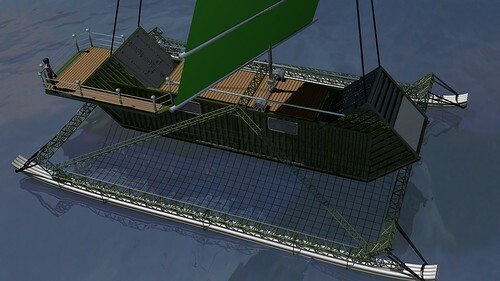 Minimal Intentions: Shipping Container Sail Boat. Im thinking about such things too. It would be even greater if living on the sea could be done in a community way. To have a haven where you can dock. Check out aquaponics..it maybe compatible in one way or another. Tidal energy besides solar should help too. bookmarked you. keep these ideas coming. nice pics! The plan is to periodically update this rendering with refinements as they come. 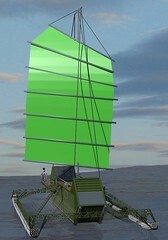 So far, going to add more pipes under the main hull to reduce the waves slapping the flat surface. 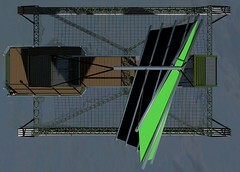 Also going to add a small greenhouse in front of the mast and solar panels that hang from the sides. Awuaponics may work, but probably for this soil gardening may be simpler. Less sloshing about of fluids. You will need to stay off the rocks, how maneuverable will this be? I agree with Larry- nice images in blender work! Thanks Shawnna. I thought you might prefer drowning over a long medically assisted coma. My first choice would have been to be composted... but that is apparently illegal. Hey we need a new minimal intention post! Readers want to know what's up. I know you have new work and all but your audience needs more inspiration! This is really cool! I like the concept a lot, and I'm excited to see updates to it. Have you considered using 55 gallon drums as pontoons? I have seen some houseboats with lines of drums welded together and painted that actually look very good. Thanks Jacques. Have not done any updates since this, but I have not given up on it either... Just a lot of other projects in front of this one. 55 gallon drums would also work well for the pontoons I think. Basically I just want to use readily available inexpensive materials. Cool, I have been having similar ideas for a while..... would be very cool if you build it! It takes 136, 55gallon plastic barrels to float a 16'x40' 24,000# load. How many pvc tubes are we talking here? Sounds like it would have to be bundles the size of ancient redwood trees ?! Last I checked an empty 40' container weighs @30'000#. 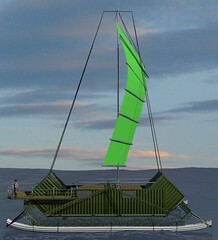 What about using two containers as pontoons each one diplaces 67 cubic tons x two equals 134 cubic tons of displacement of bouyancy. containers alone would be 6 tons dry weight. using pvc is a good idea as you can go onto a beach and put new ones in when its time to fix them, thus taking away the need to have it pulled out of the sea every year or two. the problem with using metal is that it will rust... badly.. without a lot of upkeep and lots of painting. It could be better to build floats out of pvc (barrels or piping, if its piping you will need to deign a way to replace the piping without needing to be pulled out at a marina, arrels can be done individually by beaching (gently) and digging out the sand from under the barrels to replace them). to hold the barrels or pipe, cement (ferro-cement) would be est as it does not need to be painted or have sacrificial anodes, it wont rot or have things eat into it and is not effected by UV rays, thus better for this sort of application. if the floats take the main structure out of the water fully, then just a 1/2 inch marine grade plywood structure with a coating of 9 oz fiberglass would be fine, as it would be out the water in all but the stormy weather, it wouldnt require painting or blackening every year. you could also give your self extra space, different heights, have extra bits for fuel, black water, fresh water, battery's, a generate, storage for your trade and some spare barrels or pvc pipe for repairs, you could even have a bath that hangs out the back. Thanks for the input dakota and mark. I realize that it looks like it is floating above the water in the picture, mostly because I did not want to hide the details underwater. But the container is intended to provide most of the flotation. The pontoons were mainly intended to stabilize it from falling over sideways when the wind blows. I believe it is possible to get aluminium shipping containers which should be less prone to rust. But I also like the idea of using plastic barrels for flotation as well. They could augment the pipes and would be a convenient place to store some supplies perhaps. On the ferrocement do you know if you can make a floating cement by mixing high amounts of something like perlite or crushed Styrofoam with the cement. I wonder how strong a structure made from something like that would be? have any of you seen or hear or maybe have links for anyone out there who may have converted a 20ft or 40ft shipping container into a short term liferaft or boat or even a yacht? if there isnt anything available what can you sugest thats cost effective? what are the restrictions other than the obvious welding and sealing the openings to prevent water ingress? if we load the container with enough balast wheight ( water bottles food etc) will the walls bend and be compromised ?